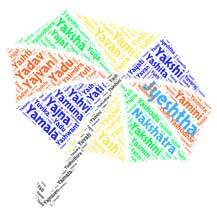 Sanskrit name Yuvan (युवन्) literally refers to young, strong, adult or youth. Yuvan also refers to healthy. Reference of Yuvan is found in Panini (पाणिनि) where Yuvan is used for younger descendant of any one. Yuvan is also referenced in Riga Veda (ऋग् वेद) in which Yuvan refers to young, youthful, adult or good. Mention of Yuvan is also found in the Epic Jyotish (ज्योतिष) where Yuvan is the 9th year in Jupiter's cycle of 60 years. This word is also referenced in Sir Monier-Williams dictionary with similar meanings as above. Yuvan is another name for the moon. Yuvan is a popular name in the USA. Yuvan is in trend since 2004 and its popularity rose in 2008 when this name was used by 12 - 37 people per year as the name of their kids. Yuvan is a somewhat popular name in India. In our opinion Yuvan is a stylish name. Yuvan also has a stylish meaning attached to it. Yuvan Shankar Raja is an Indian singer-songwriter. Yuvan Yuvathi is a 2011 Indian Tamil romance film. Nathan derived from Sanskrit word Natha ( नाथ ), which means..
Sanskrit Hema means handsome woman and the earth. According..
Means 'from a good family origin','born noble' or 'bringer o..
Atreya (Sanskrit आत्रेय) means descendant of ancient Rishi A..